Experience a 10 days trip of food and culture at Australia's most popular holiday destination with TV celebrity chef Ken James. Household name Ken James has yet another string to his bow. He is leading a small group of connoisseurs on a 10 days trip of food and culture indulgence. Stay at the new Villa Jodie in Seminyak, where Peace, Luxury and Tranquility are in abundance. Villa Jodie is a small, boutique, luxurious villa accommodation, comes complete with your own private pool and staff to pamper you. This is an exclusive, intimate culinary and culture tour with a maximum of 14 participants where you will meet the real Balinese people. In addition you will experience the culture, dine and participate in cooking with celebrity chef Ken James and two other well known Chefs and Restaurateurs. 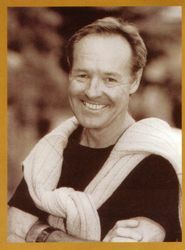 The idea came from a recent visit to Bali staying at Villa Jodie in Seminyak with Dr. David and his wife Clair Marsh who both received OAM's for their work in the aftermath of the Bali bombing. The Marsh's have built a luxurious small resort, named in honour of their friend Jodie Cearns who was one of the victims of the bombing. Meet the group at Tullamarine International Airport to board your Garuda Indonesia flight to Denpasar, Bali. Upon arrival at Ngurah Rai International airport, Denpasar we will be met and greeted by Villa Jodie Staff. Transfer to Villa Jodie. Evening cocktail party and pampering by Villa Jodie hosts. This morning is free to relax and explore your surroundings. Then travel to the five star Nusa Dua Beach and Spa Resort where lunch will be served. This will be followed by a tour and a cooking demonstration hosted by chef Jeremy Cooper. Evening is at your leisure. Shopping tour of specialty wares and bargains with the "un-rivalled queen" of shopping - Rosemarie. Dinner will be served at a local Italian restaurant. Travel to the cultural and art centre of Bali - Ubud. 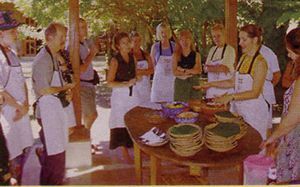 You will be taken to a market tour to choose your ingredients of your cooking class and lunch hosted by celebrated Bali chef, Janet De Neefe. Evening at your leisure. Day is at leisure to utilise your pool and all other facilities that Villa Jodie has to offer. We will take you this evening for champagne at one of bali's most beautiful beaches at Uluwatu. Wine and dine in the evening with your own celebrity chef "Ken James". Visit Denpasar market and environs for the best bargains that Bali can offer followed by a trip to Tanah Lot Temple to experience breathtaking views. The rest of the evening is at your leisure. Day is at your leisure. In the evening we will take you for Romantic Dinner at the world famous Jimbaran Bay. Dine on the beach with a fantastic selection of seafood, which includes: King prawns, sauteed calamari, crabs and delicious BBQ fish. Day is at your leisure to shop, lie around the pool, read a book, watch DVD followed by a traditional Balinese dinner at Warung (restaurant) Sorbat in Petinget. Last day in Bali for you to catch up on those last minute bargains or go to one of the many spas around for a full day of pampering. Dinner at Villa Jodie and farewell drinks. 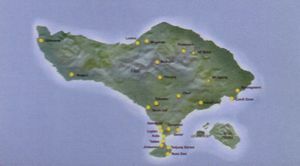 Depart Villa Jodie and transfer to Ngurah Rai International airport in the evening. Good morning Melbourne! Arrival at Tullamarine International Airport, Melbourne. "The world only exists in your eyes. You can make it as BIG or as small as you want." a division of GlobeOz Travel Pty. Ltd.
Incidentals, laundry, room service, etc .